It has been a while since I have done a 'Tea Party Tuesday' post. 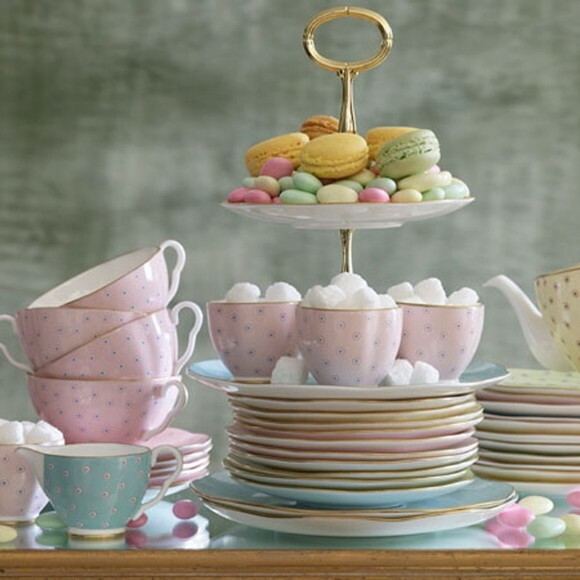 I love them, a collection of my favourite images filled with beautiful tea party goodies. As you all know lovely readers I've had quite a few tea party afternoons in my time and these posts always inspire me to do more. I'm a sucker for Alice in Wonderland centrepieces, dainty tea cakes, cake stands and all the tea party accoutrements that make a table shine. Below are some of my favourite for this week! Crochetpinkprincess made these for her friend's Bridal Shower. Aren't they gorgeous? Even thought there is no overt Alice in Wonderland imagery they are very clever tea party centrepieces. This made me chuckle. I know it is a little tacky and falls into the kitsch category I save for novelty teapots but isn't it hilarious? A cookie jar of Alice in the White Rabbit's house, I love it. Sorry folks! I love these colours, my readers know my feelings on macaroons, but this picture really makes me smile. It also makes me want to go to some thrift stores so I can try and find such a beautiful tea set! I have such a thing for duck egg blue at the moment! When I saw this cake at Cake Central I nearly wept. What a cake! Even though I bake, this is really something. It has to be the best Alice in Wonderland cake I've seen. 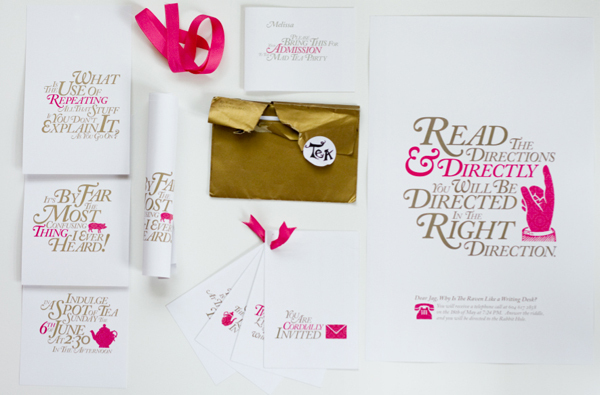 I spotted these invitations by Jag Nagra of Page 84 Design on Tumblr. Aren't they amazing? Completely Alice in Wonderland themed, designed for a tea party. A whole invitation booklet. Just marvellous. Gorgeous afternoon tea, lollies, desserts, cupcakes and sandwiches. Even a little pot of jam. I think I might use this as inspiration for my next tea party. Sharing afternoon tea stands. Love it. 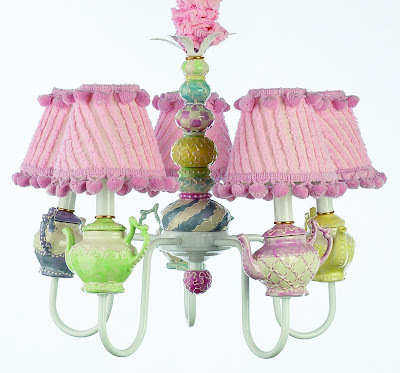 I found these amazing chandeliers on Gizmodiva. I completely adore it. I might actually have to make myself one...but what would I do with it? Oh who cares it's fabulous! I love this little centrepiece. I had never thought of putting flowers in teapots but I love it. That's my tea party Tuesday for this week, hope you're now as inspired as me to go out and get crafty.